I’ve written slugs of news for Bugpowder.com, occasional bits for Borderline and Tripwire magazines, Downthetubes, Forbidden Planet International, BleedingCool.com. I’ve also written a fair bit for a website Paddy Brown and Hilary Lawler contribute to. 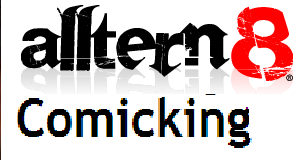 The rest of my work has been with Alltern8 and Comics Village, both gone dodo. My six-a-month was published at Alltern8.com which had it’s plug pulled in October, 2012. I had a great time there and put in some great work under brilliant sub-editor Kelly Rowles, with Andy Coley and Alex Agricola managing.